Medical device manufacturing demands a seamless concrete floor and wall coating to maintain a highly sterile and sanitary environment ideal for clean rooms, laboratories, and medical device processing lines. It is essential that your facilitys concrete flooring system is seamless, dust free and easy to sanitize. Our flooring systems comply with your health and safety standards. If you are concerned about the growth of microbes, chemicals, slipping or electrostatic discharge, ESD, interfering with your medical device manufacturing operation, Concare concrete floor coating solutions are installed in electronic, manufacturing and food facilities where these issues as well as powders and dry environments are regularly addressed. 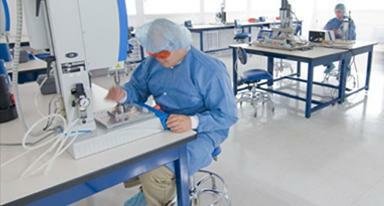 Learn more about Concare's wall and floor coating solution for the medical device industry.